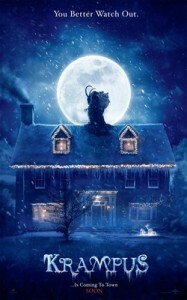 Home » Hardy Har Har Horror » Krampus might be coming for your children… if Saint Nick isn’t thrilled with their behavior. 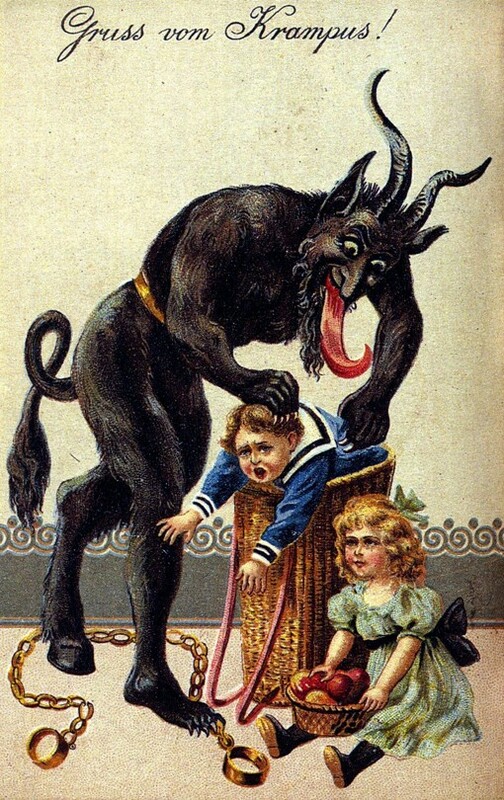 According to Wikipedia: In German-speaking Alpine folklore, Krampus is a horned, anthropomorphic figure who punishes children during the Christmas season who have misbehaved, in contrast with Saint Nicholas, who rewards well-behaved ones with gifts. Regions in Austria feature similar figures and, more widely, Krampus is one of a number of Companions of Saint Nicholas in regions of Europe. The origin of the figure is unclear; some folklorists and anthropologists have postulated a pre-Christian origin for the figure. In the 20th century, Austrian governments discouraged the practice. In the aftermath of the 1934 Austrian Civil War, the Krampus tradition was prohibited by the Dollfuss regime under theFatherland’s Front (Vaterländische Front) and the Christian Social Party. In the 1950s, the government distributed pamphlets titled “Krampus is an Evil Man”. Towards the end of the century, a popular resurgence of Krampus celebrations occurred and continues today. The Krampus tradition is being revived in Bavaria as well, along with a local artistic tradition of hand-carved wooden masks. There has been public debate in Austria in modern times about whether Krampus is appropriate for children. Krampus is a 2015 American Christmas horror-comedy film based upon the eponymous character from Alpine folklore, directed by Michael Dougherty and written by Dougherty, Todd Casey, and Zach Shields. The film stars Adam Scott, Toni Collette, David Koechner, Allison Tolman, Conchata Ferrell, Emjay Anthony, Stefania LaVie Owen, and Krista Stadler. It was released on December 4, 2015, by Universal Pictures.